Learning how to tie shoelaces is something seems to come naturally to some children but is a massive struggle for others. Knowing where your child can help you to utilize the following tips to help them best. One great way for children to learn how to tie their shoes is to be able to practice. Having a shoe tying board is an excellent way for them to practice and turn it into a fun game. All you need is a couple of shoelaces and a piece of cardboard. You can even upcycle a box and make a table. Trace a couple of shoes and then punch holes so that you can run the shoelaces through them. Thin laces can be challenging to learn to tie with. You want medium width laces. You want them to be wide but not too wide, so the common width ones are perfect. Another significant advantage to thicker laces is that they tend to be more comfortable to keep tight while your child is learning to tie the bow part. Make sure to choose laces that are made out of cotton or another synthetic material. The laces that are made out of slippery materials are much harder to learn with. There are so many methods out there. If you try starting with a double starting knot, you might find that this can help beginners with keeping it tight enough. For some, this does not work, but for others, this is a key to their starting success. One great thing for you to think about is finding shoes that are the perfect size. 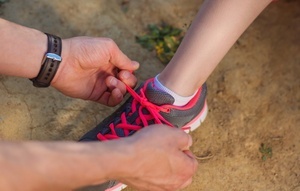 If the shoe is already a little tight when you are starting it is going to make it easier as the shoes can be tied looser without causing problems with fit. Training laces are great because they offer you laces that are two different colors. This can help beginners. You can also color half of a white shoe lace black when your child is learning as this can help them too without having to buy something special. If you want to have success with learning to tie shoes, it is going to take practice. Make sure that your child is untying their shoes at night and not just slipping them on. Practicing will make perfect so it is important that they continue to untie them. 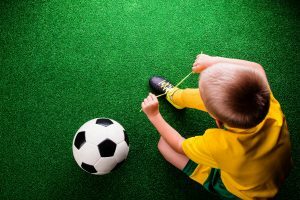 This method is known as being an excellent tool for parents who want to teach their child how to tie their shoes quickly. Step 1 – Cross the shoe laces like normal. Step 2 – Take your right hand and put your thumb and first finger in front of the lace so that your fingers are facing you. Take your left hand and place your thumb and ginger behind the lace with your fingers facing away from you. 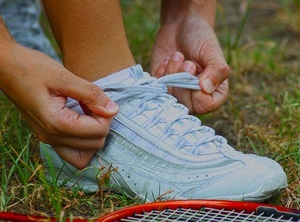 You will be using your pinky fingers to help you grip the laces tightly at this point. Step 3 – Pull your fingers towards you until the lace feels tight. Then twist your fingers so that they are facing each other. Step 4 – Now take your fingers and pinch the opposite laces in between them. Step 5 – Pull the laces through. You will end up with a well-tied shoe in a way that is easy for young children to learn. It is suggested that this method is used with children between the ages of 4 and 6. For many kids, learning to tie their shoes can be a big challenge. Kids with motor skills issues often have trouble coordinating both hands at the same time. And some other kids may not be able to remember all the steps. This can lead to a lot of frustration. Here’s a simple shoe tying method that you can try with your child to reduce that frustration. It’s a popular method that we’ve adapted specifically for kids with learning and attention issues. One of the hardest parts for kids when tying shoes is bending over to reach their feet. So start with a shoe on a table in front of your child facing away from him. You don’t need to use two different colored laces, but it can help some kids to see how this works. First, cross the laces, drop them, loop-de-loop, and pull them tight, just as you would if you were tying shoes the traditional way. Second, cross the laces, drop them, loop-de-loop, and pull them, but leave a small circle. Third, take the end of one of the shoelaces and put it through the circle. Repeat with the other shoelace. Lastly, pull the loops of the shoelaces tight. And there you go, you’ve tied your shoes! The reason this method works well for kids is that it uses the same motion twice. That makes it easier for kids to learn the motion and remember the steps. Once kids have mastered tying shoes on a table, they can try it with their shoes on. They can start by sitting down with one foot up on a stool to see what they’re doing. Then, when they’re ready, they can tie their shoes while standing, kneeling, or sitting on the ground, whatever is most comfortable for them. Kids with learning and attention issues need a lot of repetition and practice, but each child learns at his own pace, so just keep practicing until your child has mastered the steps..